Over the last few years, many individuals (myself included) have been feeling tremendous anger about the level of executive compensation in the US, an anger that is particularly strong against those in the financial sector. As you can see in the chart below, there is an incredible gap between CEO compensation in the US compared to most other countries. 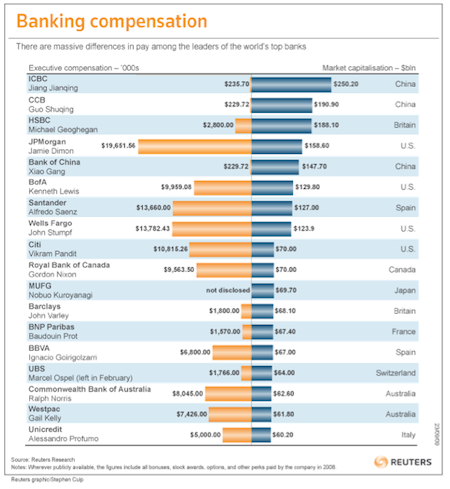 Bankers are paying themselves exorbitant wads of cash, seen in both in their salaries and bonuses. And in their defense, the bankers in question claim that such extravagant wages are essential to properly motivate them, and that without such motivation they would just go and find a job somewhere else (they never exactly specify which jobs they will get and who will pay them more, but this is another matter). Inordinate compensation levels aside, it is important to try and figure out more generally how payment translates into motivation and performance. There is a general assumption that more money is more motivating and that we can improve job performance by simply paying people more either in terms of a base salary, or even better as a performance-based incentive – which are of course bonuses. But, is this an efficient way to compensate people and drive them to be the best that they can be? A new paper* by Mike Norton and his collaborators sheds a very interesting light on the ways that organizations should use money to motivate their employees, boost morale and improve performance – benefiting both employees and their organizations. The researchers looks at a few ways that money can be spent and how that affects outcomes such as employee wellbeing, job satisfaction and actual job performance. Specifically, they examine the effect of prosocial incentives, where people spend money on others rather than themselves, and they find that there are many benefits to spending money on others (think about the inherent joy of gift-giving). In the first experiment, the researchers gave charity vouchers worth $25 or $50 to Australian bank employees and asked them to donate the money to a charity of their choice. Compared to people who did not receive the charity vouchers, those who donated $50 (but not $25) claimed to be happier and more satisfied with their jobs. The second experiment took the concept of prosocial incentives a step further by directly comparing people who were asked to spend money on themselves (a personal incentive) with those who were asked to purchase a gift for a teammate (a prosocial incentive). This experiment took place in two different settings — with sales and sports teams — and looked at a broader range of outcomes. It not only examined employee satisfaction, but also the other side – benefits to the organization in terms of employee performance and return on investment. While neither sales nor sports teams improved when people were given money to spend on themselves, Norton and his colleagues found vast improvements for those who engaged in prosocial spending. While they were purchasing a gift for a teammate, they also became more interested in their teammate and were happier to help them further in multiple other ways. If we compare these experiments, we can also see that while a gift of $25 did not make a difference when it was donated to a faceless and impersonal charity, a gift of $20 provided numerous positive outcomes when it was given in the form of helping out a teammate. Thus, it appears that we can reap the greatest benefits when we spend money on others, and even more when we spend money on close others. Taken together, these results also suggest that our intuitions are leading us down the wrong path when we assume that we will be happiest and most motivated when we earn money to spend on ourselves. The findings from this paper can be extended to recommendations for current business practices, particularly in cases where compensation is very high. In fact, Credit Suisse has gotten a head start on adopting the idea of prosocial spending, as it has recently implemented a program requiring its employees to donate at least 2.5% of their bonuses to charity. Now, is this just a PR trick to try and diffuse some of the anger that people feel these days about bankers, or is this a real effort to increase and improve motivation? I don’t know. But what is clear to me is that prosocial incentives, either in the form of charitable donations or team expenditures, can be an effective means of encouraging more positive behavior for the individual, their teammate and for society. * Norton MI, Anik L, Aknin LB, Dunn EW & Quoidbach J (manuscript under review). Prosocial Incentives Increase Employee Satisfaction and Team Performance.